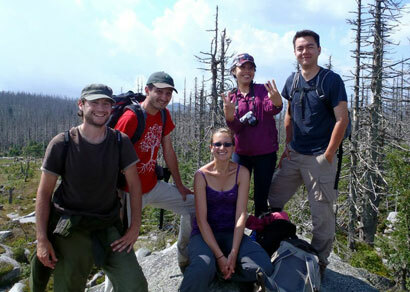 The transatlantic forestry master dual degree program (TRANSFOR-M), which started in 2010, allows students to spend one year working on their degree in Canada and one year at a European institution. Students in the program will earn both a Canadian and a European master's degree in forestry and environmental management. UNB's faculty of forestry and environmental management leads the Canadian initiative, partnered with the University of British Columbia and the University of Alberta. The European partner universities are: Albert-Ludwigs-Universität Freiburg in Germany, Bangor University in Wales, the University of Eastern Finland, and the Swedish University of Agricultural Sciences. Until September 2014, nine UNB students taking part in the TRANSFOR-M program will receive a scholarship funded by the Human Resources and Skills Development Canada (HRSDC) international academic mobility program. Applicants to the TRANSFOR-M program are selected based on their GPA and extracurricular activities. UNB’s Brigitte Leblon, TRANSFOR-M’s Canadian coordinator, said that UNB’s involvement in the TRANSFOR-M program draws additional graduate students to the university. "The master’s program will be customized for each student," Prof. Leblon said. "This is a great international opportunity for students to earn two degrees at the same time on both sides of the Atlantic Ocean." Chris Smith is enrolled in his second year of a dual masters degree at UNB and the University of Freiburg in Germany. From Cole Harbour, N.S, Chris said he has always wanted to expand his knowledge of forestry and environmental management upon completion of his bachelor's degree. "I always wanted to travel around Europe and see different countries, cultures and forestry practices, and this program offered a year-long, funded opportunity to pursue that desire," said Chris. Chris said the lessons he's learned and experiences he’s had through TRANSFOR-M have been invaluable. "I've had some of the best experiences of my life over the last year and a half I've been with this program. For anyone who has ever wanted to travel, learn, meet new and interesting people or to just have fun, this is the opportunity that gives you all that and so much more. I've made lifelong friends, learned more about life than the four years of my undergraduate combined, and have forged an exciting and worthwhile career path, all because I took a leap and enrolled in the TRANSFOR-M program." Applications for next year's placements are being accepted now. The deadline to apply to the program is January 31, 2013. For more information, please contact Brigitte Leblon.